FIVE SLIDE ROOMS MAKE FOR AN AMAZING AMOUNT OF SPACE!!!! That’s the Grand Design Solitude 375FL Fifth Wheel. 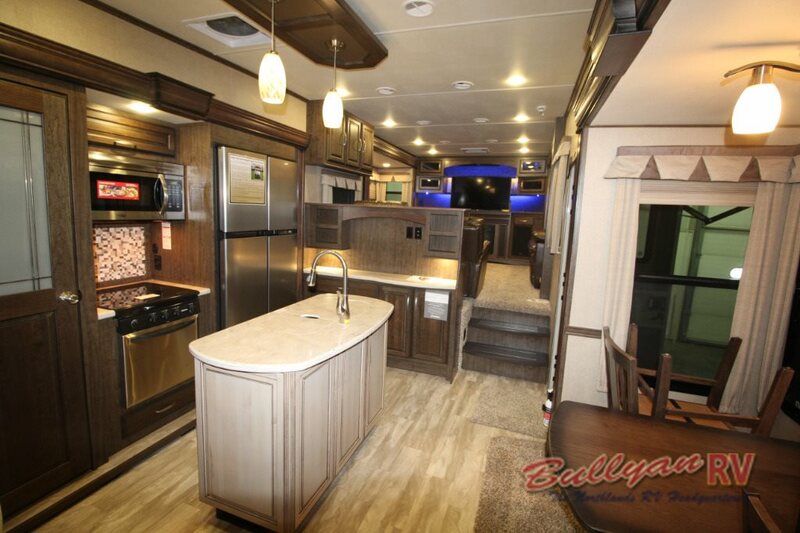 Get ready for style, space, luxury and looks in a fifth wheel that won’t break the bank. For entertaining and ultra comfortable living, the Grand Design Solitude 375FL is the ideal floorplan to fit your needs. With the value packed amenities Grand Design Fifth Wheels are known for, you will be amazed at all the luxury extras packed into this eye catching fifth wheel at a not so luxury price. The Solitude 3725FL model offers front living, 5 slides, a kitchen island and plenty of seating. 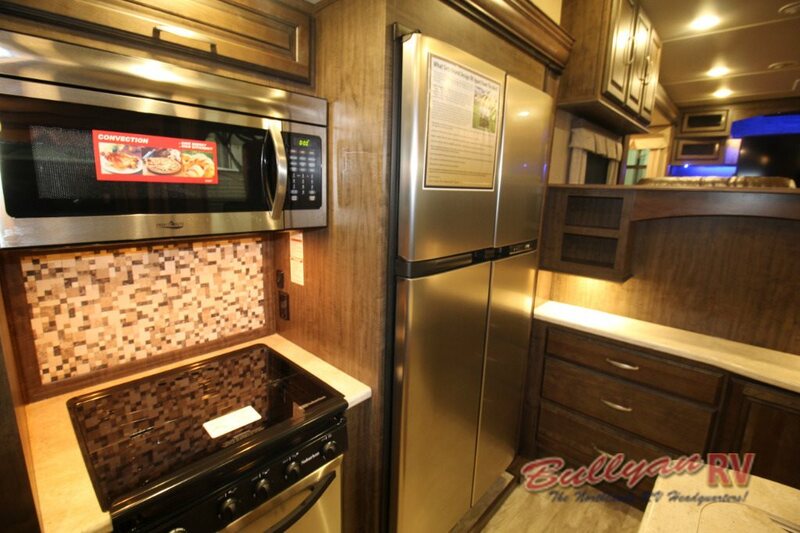 The gourmet style kitchen is sure to please and the quiet bedroom in the rear of the coach is perfect for a restful night’s sleep. Dual opposing slides give the kitchen and dinette space an expansive quality, perfect for entertaining. The center island with double sinks offers extra counter space which is always needed in an RV kitchen. Cabinets and drawers surround the Solitude kitchen lending an impressive amount of storage capacity for pots, pans, utensils and dry goods. Upscale furnishings and high end appliances make cooking in this beautiful environment a joy. Heading up the stairs to the front living area, an elegant fireplace and large 50″ LED TV preside over a circular arrangement of comfortable seating. There’s not a bad spot in the house, everyone will have a good view of the big game. Walking back through the kitchen towards the rear of the coach, you will pass by a conveniently situated bathroom, easily accessible to both guests and the bedroom. Further down, you will meet the bedroom which features a second door directly accessing the outdoors. This way, you can greet the morning with fresh air only a few steps away. Choose from a queen bed or optional king bed, each offers a pull-out ottoman at the foot. This handy addition gives you a spot to sit while putting on shoes or enjoying a quick rest before heading out for the day. The Grand Design Solitude 375FL Fifth Wheel also has a large walk in closet that provides enough space for your favorite clothes and accessories. 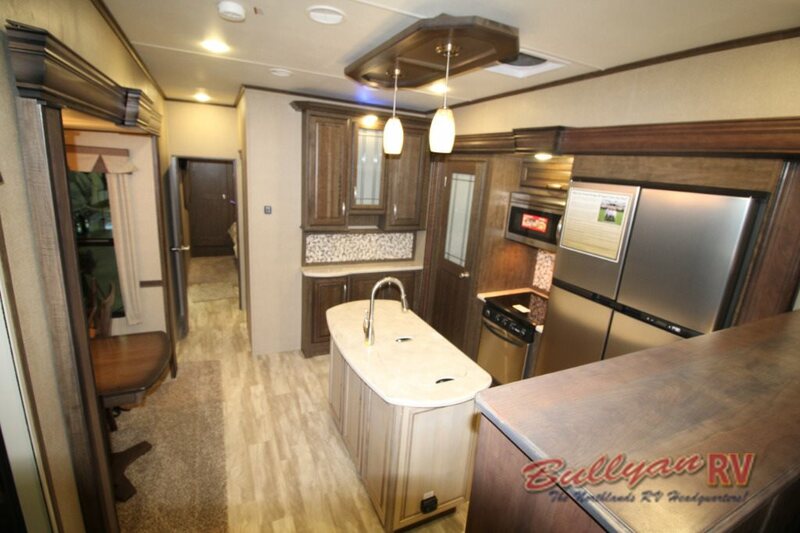 To take a tour of this well equipped coach, Contact Us at Bullyan RV or visit us at Our Location. 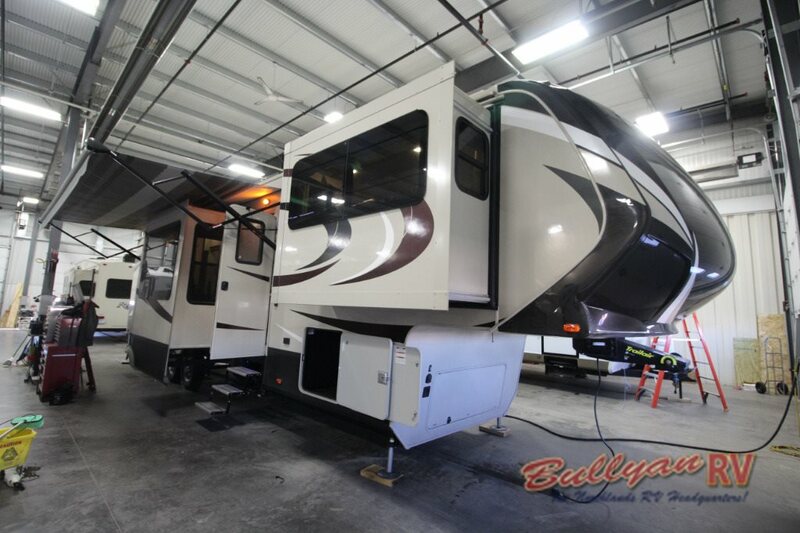 This is one fifth wheel you won’t want to miss!